When it comes to haircare I used to mainly buy salon brand / more expensive high end products, as I genuinely didn't think that there were cheaper high street ranges that would do as good a job. In recent years though I feel like high street brands have upped their game and there are some great ranges out there. 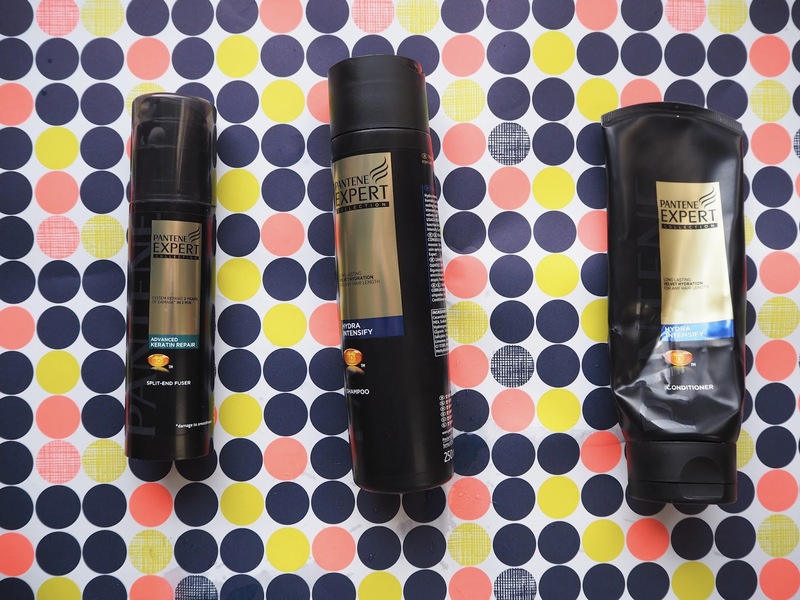 One range I have really been enjoying recently is the Pantene Expert Collection. I've tried a couple of different products from them now and have been impressed from the get-go. The first things I tried were the Advanced Keratin Repair Shampoo and the Hydra Intensify Intense Hydration Masque. I really like the packaging, nice and classy and I think the black makes the range look a lot more expensive than it is. The shampoo I liked from my first use - my hair looked really lovely and shiny afterwards, like I'd been to the hairdressers. At the same time I was trying the mask, using it a couple of times a week as an intense conditioner. It says you only need to leave this on for 2 minutes so it's great as a speedy treatment (I sometimes left it for up to 10 minutes though as an extra luxury!). I went for a hair appointment a month after using these 2 consistently and my stylists commented that my hair was in really good condition so I decided to buy a couple of more products from the collection. The next items I bought were the Hydra Intensify Shampoo and Hydra Intensify Conditioner - I really like both of these too, although in terms of shampoo I think I prefer the advanced keratin repair, so think I'll go back to that once I've used up my current supply. I've also been using the Advanced Keratin Repair Split End Fuser - rubbing some through the ends of my hair before blow drying. Now I realise no product can *fix* a split end (other than a pair of scissors) so I can't say it's made a huge difference to my hair (and probably not something I'd repurchase) but my ends have felt a lot less dry since using it, so it is doing *something*! Overall I've been really impressed with the range and I'll definitely be trying more products from the collection, and repurchasing a couple too. A very well detailed blog, I reckon I will use some of your tips/advice to put towards the girlfriends presents this valentines day. Thanks, Ross.